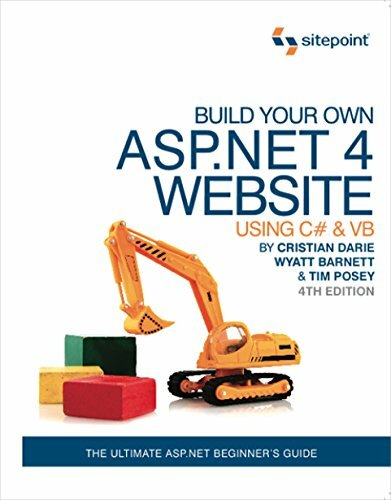 [PDF] Build Your Own ASP.NET 4 Web Site Using C# & VB, 4th Edition | Free eBooks Download - EBOOKEE! Posted on 2018-01-05, by luongquocchinh. Description: Build Your Own ASP.NET 4 Web Site Using C# & VB is aimed at beginner ASP.NET developers wanting to develop their skills, web designers wanting to move into server-side programming, and experienced developers making the leap from ASP to .NET. Readers will learn: â€¢ language and programming basics â€¢ how to construct ASP.Net Web Pages â€¢ how to build web applications â€¢ to use validation controls â€¢ database design and development â€¢ how to use ADO.NET â€¢ how to manage data and content â€¢ how to integrate Ajax and jQuery â€¢ the role of MVC ... all in the process of successfully developing and deploying a working intranet site for a fictional company. Tim Posey is a long-time developer and a passionate educator. Armed with a B.S. in Computer Science and an M.B.A. in Finance, he has traversed many industries, consulting for multiple corporations in banking, insurance, energy, and various e-commerce industries. As a serial entrepreneur, Timâ€™s latest project is mentoring the startup of the LegacyGeeks.com community. He serves as a senior software engineer at a Fortune 1000 company and an Adjunct Professor of Finance for the American Public University System. His favourite pastime is watching Alabama football. No comments for "[PDF] Build Your Own ASP.NET 4 Web Site Using C# & VB, 4th Edition".